I took this pic in 2012 at the summer. 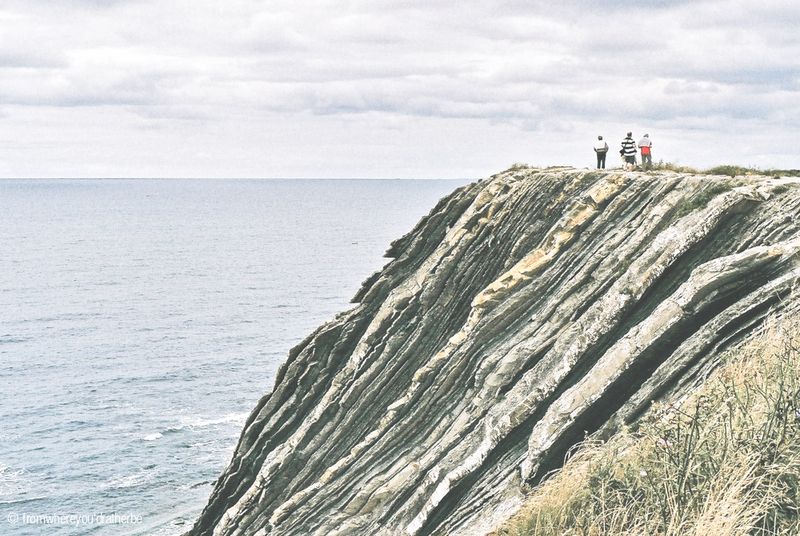 My family were visiting me here in the Basque Country, and while getting back from Biarritz, we passed through La Corniche, a fabulous wild and rocky spot that stretches from Hendaye to Saint Jean de Luz. This is a protected natural site with 65 hectares, and what always fascinated me the most about this place, is the stunning plaques of rocks disposed this way due to the tectonic movements of the earth. Another plus, the Belharra spot, worth the watch in winter with big waves. This last winter for example during the "Hercules" swell, this spot scored some of the biggest waves in Europe. Check out some of the waves here. Even Shane Dorian traveled this winter all his way from Hawaii just to surf this brake. If you have the chance and you're around, don't miss this great view. Surf, Yoga & Fun Retreat in San Sebastian!